Joint Seminar with ENT: Dr. David Bowles, National Park Service, Heartland Inventory & Monitoring Network,“High magnitude springs of the Missouri Ozarks and their influence on river invertebrate communities"
Dr. Matthew Kauffman, University of Wyoming,Wyoming Cooperative Fish and Wildlife Research Unit,Title: "Animal Movement, Anthropogenic Barriers, and Corridor Conservation in the American West"
In 2016 and 2017 there were over 250 attendees at the Iowa Aquaculture Conference each year! 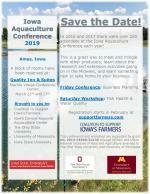 This is a great way to meet and mingle with other producers, learn about the research and extension activities going on in the Midwest, and learn something new to take home to your business. NREM Seminar - Graduate Student IGNITE Talks! NREM Graduate Student IGNITE Talks! Emily Zimmerman will defend her Ph.D. dissertation entitled “Identifying opportunities for co-production of commodities and water quality improvements in agricultural landscapes in the US Cornbelt” on Friday, January 11, 2019 at 12:00 PM in 333 Science II.